Nokia might not be technically manufacturing phones anymore, but Nokia-branded handsets (made by HMD) are reportedly beating Google, HTC, and OnePlus sales. Counterpoint analyst Neil Shah revealed on Twitter that HMD’s Nokia-branded Android phones outsold HTC, Sony, Google, Lenovo, OnePlus, and a number of other manufacturers in the recent holiday quarter. TechRadar reports that HMD sold 4.4 million Nokia-branded phones in Q4 2017, that’s more in three months than Google’s Pixel sales for the entire year. While Nokia’s brand rebound in phones sounds impressive compared to the competition, it’s still at the bottom end of the smartphone market. If the figures are accurate then HMD’s phones are 11th in terms of world marketshare, at just a single percent. HMD has a lot of work to do to catch up to the likes of Huawei, Samsung, or even Apple, but if the pace continues after just a year then the sales could soon eclipse the 10.5 million Nokia Lumia devices that were sold during Q4 2014 at the height of the Windows Phone era. HMD is now planning to host a press conference at Mobile World Congress in Barcelona next month. While we’re not expecting another retro Nokia 3310 or a trio of new Android phones, there will still be some surprises in store for fans of the Nokia brand. 6.1 plus at a price 15999 and online partner is Flipkart. HMD Global at the launch event of Nokia 7.1 also detailed some information about the release of Android 9 Pieupdate for other Nokia smartphones. Android 9 Pie update recently rolled out to the company's Nokia 7 Plussmartphone. Now, besides the unveiling of a new smartphone, Nokia has confirmed Android Pie updates for some more handsets. 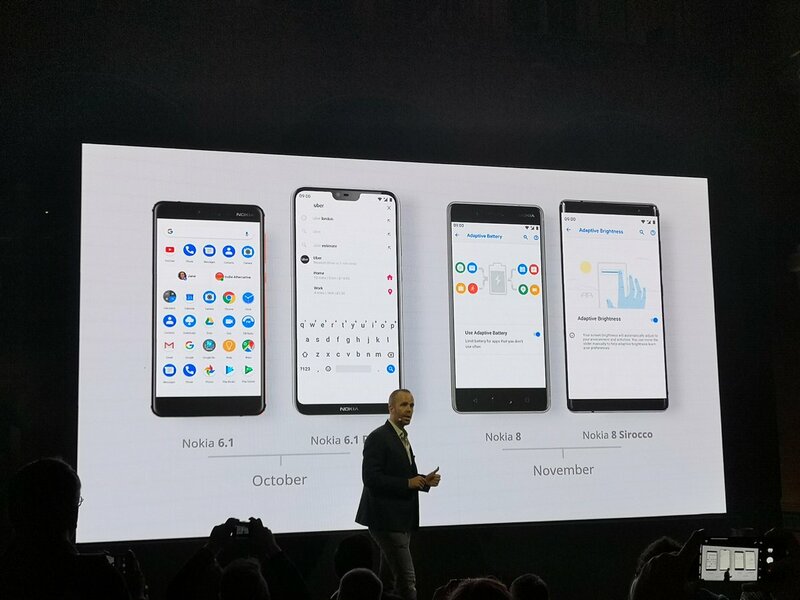 At the event, the company noted that the latest Android update was heading out to smartphones like Nokia 6.1, Nokia 6.1 Plus, Nokia 8, and Nokia 8 Sirocco starting this month. As expected, HMD Global is prioritising some of its more popular smartphones for the Android Pie rollout. Firstly, that includes handsets running on the Snapdragon 600 SoC series, starting with the Nokia 6.1 and Nokia 6.1 Plus. Both the smartphones should start receiving the update sometime this month. On the other hand, the Nokia 8 and Nokia 8 Sirocco should get their respective Android 9 updates in November. Notably, the company did not provide any clear dates for the release of the update to the smartphones. The latest information coming from Nokia is great to see as the company has gone all-in with Android One in the last few years. Its smartphones come with promises of monthly security updates and system updates for at least two years from their respective launches. During the event, Nokia also noted that it is planning to roll out Android 9 Pie updates to some more smartphones in its lineup following the initial list of handsets. Notably, HMD Global launched the Nokia 7.1 running on Android Oreo, based on the Android One programme. However, it has promised an upgrade to Android 9.0 Pie slated for next month.